Posted at: 11/19/2011 08:10:00 AM . AMC has gotten two million fans on Facebook. 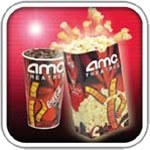 To celebrate they are giving away free small popcorn through coupons on the AMC Facebook page. The coupon is good from December 2-4, 2011.